Housed in state of the art rooms, Design and Technology at Sexey’s can offer students a hugely rewarding educational experience. The national curriculum for DT aims to ensure that all students develop the creative, technical and practical expertise needed to design and make quality products for a wide range of users. Through practical activities in resistant materials, graphics, electronics and food, students are equipped with the knowledge, understanding and skills to engage successfully in an iterative process of designing and making. The study of past and present designers helps students become aware of the importance and impact of design and technology on the wider world. Both DT and Food and Nutrition are taught in mixed ability groups as part of a creative carousel of subjects. During the year students will have 16 – 18 lessons in each area. There is a spacious and well-equipped workshop, a CAD/CAM room complete with laser cutter, and a large food room. To enable students to design and make successfully they learn how to analyse and research existing products, how to communicate their own ideas graphically and how to evaluate their end product. Projects in resistant materials are chosen to cover the techniques required to work with wood, metal, plastics and electronics. Skills taught include cutting, polishing, measuring, casting and soldering. Time management, personal organisation and independence are all areas of focus. After an initial introduction to the workshop and safe working practices students will work through 3 design and make projects; Chinese tangrams working with wood and plastic, electronic dice and graphics games board and graphic design work for packaging chocolates or perfume. These projects introduce students to working with different types of materials and a variety of hand tools. 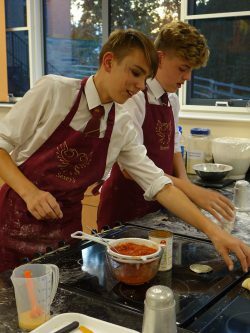 In the food room students will complete three topics designed to develop food preparation skills and their understanding of a healthy balanced diet; ‘Getting ready to cook safely’, ‘Breakfast and the Eat well guide’ and ‘Bake it’. Practical work may include soup, fruit flapjack, crumbles, savoury picture frame tarts, tortilla, stir-fry, pasta salads and scone based pizza. Inspired by the local architecture of Bruton, students build on their Year 7 experiences to create ever more complex and innovative outcomes. As an ongoing process of development where students are encouraged to play an ever-increasing role in their design giving ownership and value to the making. In Food and Nutrition students look at the function of ingredients in yeast cookery and other bakery products, the role of nutrients in the diet, cooking with seasonal foods and planning healthy meals using staple foods. Examples of practical work include bread, Chelsea buns, focaccia, quiche, fruit flan, sauces, pasta bake and risotto. Projects in Year 9 include designing and making metal candlesticks, and electronics work producing mood lamps and mechanical toys, which involve the use of the laser cutter. It is the individuals’ creative abilities that generate so much enthusiasm and diversity in their work. By this stage, students will have experienced a wide range of designing and making at Key Stage 3 and may elect to continue in Key Stage 4. In Food and Nutrition students look at factors affecting food choices including special dietary needs, cultural, ethical and moral issues. Through a project on street food, they cook a range of multicultural cuisine and investigate food labelling. In a final topic on cake making students examine the functional properties of ingredients and at the end of this module design their own cake for a celebration. Practical work may include sausage plait, fair-trade biscuits, spaghetti Bolognese, sweet and sour chicken, curries and other main course meals. 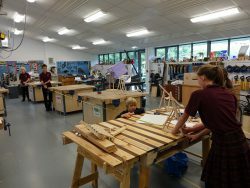 GCSE Product Design (WJEC) – encourages students to design and make creative and original products and packaging, which mirror commercial outcomes using a wide variety of materials such as wood, metals, and plastics. This will involve using hand tools, machinery including the laser cutter and CAD/CAM in addition to learning about quality control, health and safety and ergonomics. Through designing and making students will develop skills in analysing and evaluating products and processes, develop ideas and recognise the moral, cultural and environmental issues inherent in design and technology. GCSE Food Preparation and Nutrition (AQA) – focusing on food science experimental work and practical cooking skills. This course allows students to demonstrate their creativity when making food products and helps to develop a thorough understanding of nutrition and health, food provenance and the working characteristics of food materials. They will investigate how everyday food products are designed and manufactured safely. A scientific food investigation task (15%). Students will submit a written report (1,500–2,000 words) including photographic evidence of the practical investigation. A Food preparation assessment task (35%). Students’ knowledge, skills and understanding in relation to the planning, preparation, cooking, presentation of food and application of nutrition related to the chosen task. Students will present a final menu of three dishes in three hours and submit a written portfolio with photographic evidence of all trialling. In both options, coursework is closely monitored so that students feel supported. The results of the department have consistently been some of the highest achieved by the school and within Somerset.